Businesses in the Leeds City Region are to benefit from a unique regional initiative aimed at boosting international trade, it has been announced today in Leeds. ExportExchange is an online and offline network which aims to help businesses within the city region and beyond to increase exports, grow revenues and create employment. The ExportExchange programme is backed by the European Regional Development Fund (ERDF) and delivered by the Leeds City Region Enterprise Partnership (LEP), the Department for International Trade (DIT), and a number of private sector media, marketing and export specialists. 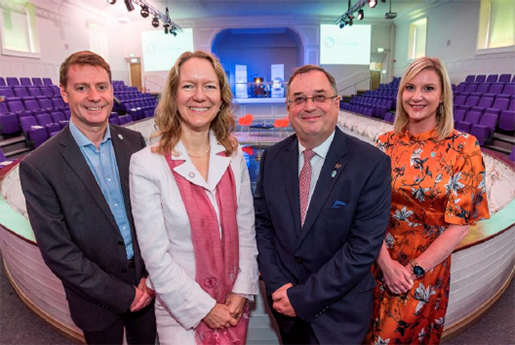 The initiative was launched by Roger Marsh OBE, chair of the LEP, and Marian Sudbury, director of the Northern Powerhouse for DIT, in Leeds on 30 June at AQL’s Salem Chapel building in the Holbeck area of the city. The launch event saw a host of invited guests from businesses in the Leeds City Region that are already successfully exporting come together as ‘patrons’ to back a programme that will pool their expertise and know-how to help Yorkshire firms that want to develop their overseas trade.